It seems like it was just a couple of weeks ago that we moved Brad into his freshman dormitory at Eastern Michigan University. Well, whether I want to believe it or not, it was four years ago! Yup, four. years. ago. Where did the time go? We recently got back from Brad’s graduation. Based on the picture at the right, I’m not sure who was happier. 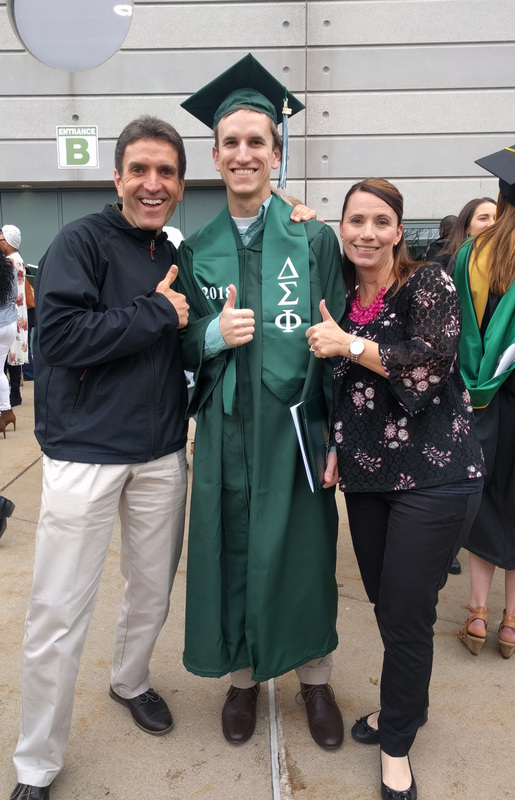 I know Brad had to be excited, but we as parents were also happy to have our second one through college. Having the financial burden and responsibility of a second child finishing school is a clear cause for celebration. It’s also a time for reflection, which I did plenty of during the weekend. Before I take a short walk down Sentimental Street, here are a few images of the graduation. 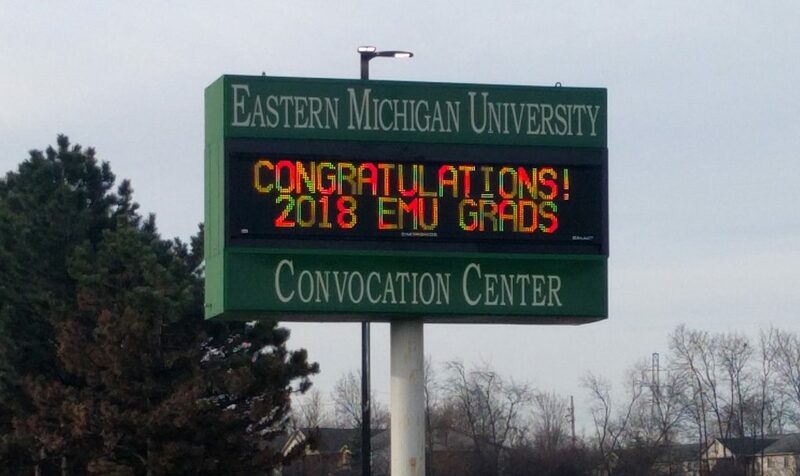 I must admit that Eastern Michigan did a great job with the ceremony. It was one of the most efficient ceremonies I’ve witnessed or been a part of, which includes both college and high school graduations. They kept things moving while giving the students ample opportunity to enjoy their accomplishment and moment in the spotlight. It was a great day for the graduation, just a touch on the cool side. 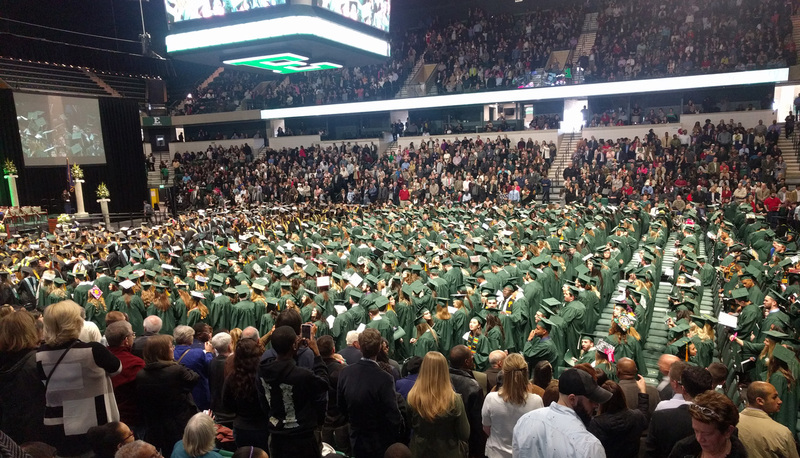 Finding Brad in the sea of green on the graduation floor was a bit like playing a game of Where’s Waldo? After the ceremony – it’s official! Watching Brad walk across the stage brought back a lot of amazing memories. It’s always fun to think back and reflect on all of the great times we’ve had together and as a family. I’m not going to go into the details of all his sporting events, coaching him through football, watching him grow and mature through high school, and all of our family outings and vacations. There are too many to cover here, but I enjoyed them all. I still have vivid memories of moving Brad into his freshman dorm at EMU. It felt a little odd dropping him off 2,000 miles from home, but I knew it was part of the growing up process. One has to leave the nest and figure out how to make it on their own, which Brad did. He did a great job staying focused at school. He finished in the allotted four years with very respectable grades, which seems to be more the exception than the norm these days. For me, one of the greatest joys of a parent is watching your child grow and mature into an adult. 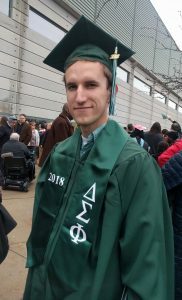 I know that Brad still has quite a ways to go as he sets out on the next chapter of his life, but graduating college is a significant milestone. It’s one he should be very proud of, and I am extremely happy for him. I remember the exhilarating feeling I had at the end of my college graduation as I walked out of the RPI Fieldhouse. I’m not certain if it was being finished with school or the anticipation of starting the next chapter of my life. Either way, I’m sure that Brad felt a little bit of the same excitement as well. And just like that, four years pass you by. Congratulations Brad! It’s time for you to start the next chapter of your life, to strike out on your own, to make your unique impression on the world. As you embark on your journey, don’t forget the inspirational words of Ferris Bueller, spoken in his own voice. I wish you all the best. 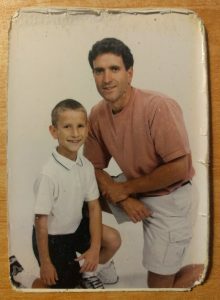 This entry was posted in Life Journal on April 28, 2018 by Gregg Borodaty.